Equal parts Shakespeare and Machiavelli, BBC Four’s dramatization of “House of Cards” after a novel of the same name by Michael Dobbs, is a guilty pleasure and one worthy of examination by political junkies, drama addicts, BBC enthusiasts, Anglophiles and the sartorially curious. 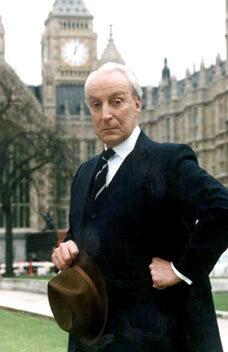 The series takes place just as Margaret Thatcher’s downfall is beginning. 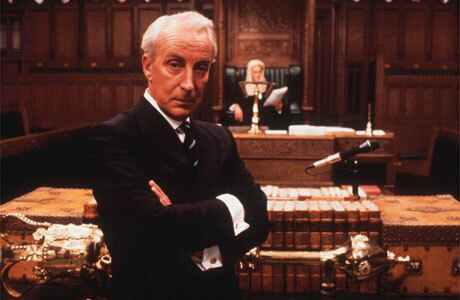 Through the course of the original miniseries and the two sequels, the Chief Whip, played by Ian Richardson, is dressed in a surprisingly consistent, understated and fairly well-tailored way. He is the ultimate expression of elegant in his carefully edited wardrobe. And as for easy? Well, as far as I can tell, he owns fewer suits than I (although one would assume they are all bespoke) and pairs them almost exclusively with school or club ties and white french-cuffed (he would say double-cuffed) shirts. The one exception I can recall is the scene where he is shown hunting on his estate. In appropriate tweeds and flat cap? Or it may have been a deerstalker. Regardless, nothing about the man, save his wit, evil and elegance stands out. Which is really the ultimate goal of elegance — perfectly attired and well-mannered without shouting about it. Now, I don’t advocate evil as a lifestyle choice. As for wit and elegance, as with Irons’ Von Bulow, you could do worse for a role model. Concentrate on appropriate choices in the best material, have it tailored with precision and with an eye to fit and proportion. While you may not Wow! them, you will always be the best dressed person anyone knows. Go see for yourself. Oh, the title of my post? Wikipedia reports that Richardson’s character’s name is based solely on the desire to use those initials. What do you think? This entry was posted in Elegantology and tagged BBC, Elegantology, movies. Bookmark the permalink. I absolutely loved this trilogy, and for many of the same reasons you posted. Just last week I was watching the DVD (for the umpteenth time), and my wife asked, “Didn’t you watch this already?” I told her yes, but I just loved how they sounded, acted, and looked! I think it’s funny that you posted this so soon after that conversation with my wife!